It’s 9 a.m. on a Friday, and the Mirror Pond Plaza is already bustling with activity. Friends chat at the café tables over coffee and croissants. Children play on the steps between the square and Drake Park. 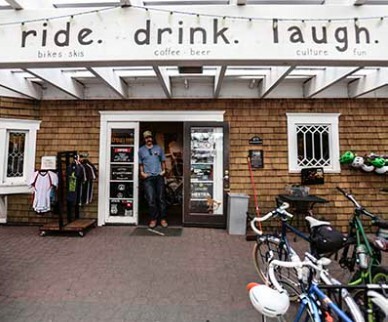 Customers stop inside Crow’s Feet Commons to check out bikes. And tourists pass through en route to the river. It’s all part of the family-friendly vibe Crow’s Feet owner David Marchi and his staff have struggled to sustain in the city-owned space with a history of attracting those with no place else to go. That was part of the deal he made with the city in 2013 when he won a bid to lease the 500 square feet of plaza adjacent to the historic Goodwillie-Allen-Rademacher House he’s occupied since 2012. Marchi was looking forward to continuing that effort, but his hopes were dashed when the city unexpectedly declined to renew his plaza lease last Wednesday, just a few weeks after assuring him everything was on track. (Crow’s Feet’s lease on the Rademacher House is unaffected.) There’d been a few hiccups—questions about OLCC site plans, storage units, and signage—but city staff told him he could expect to receive the lease in early August. Instead, he was told that his efforts to create a “lunchtime atmosphere” were not successful, and that the city felt confident it could address the vagrancy issue through collaboration with community agencies. In short: Thanks, but no thanks. We’ve got this.Marchi says he was surprised, and offended by the insinuation that the reduction in undesirable activities had been accomplished without his help. He also contests the claim that he hasn’t drawn lunch traffic, adding that the staff who made that call rarely visit his establishment. City of Bend Special Projects Director Brad Emerson, who sent the rejection letter, says that his staff didn’t see much happening during lunchtime, but couldn’t specify during what time of year they stopped by, or how frequently. “We didn’t see that it was accomplishing what it was intended to accomplish,” Emerson says. The space has a troubled past. When the Rademacher House—the former home of Bend’s first mayor, which is listed on that National Register of Historic Places—was occupied by nonprofit Arts Central, drug activity and public indecency in the square were so bad that the organization’s director Cate O’Hagan says she carried a loaded .38 until she finally had to leave the space. Since Crow’s Feet Commons moved in and took on the plaza lease, neighbors say things have improved significantly. O’Hagan and Cowgirl Cash owner Rebecca Charlton both say the lunchtime foot traffic has deterred undesirables. And Downtown Bend Business Association Director Chuck Arnold agrees that the plaza is better off. But the city disagrees. Beyond the perception that Crow’s Feet was not attracting a sufficient lunchtime crowd and the city’s desire to take a different approach to addressing vagrancy in public spaces, City of Bend Business Advocate Carolyn Eagan says there was some concern about the shop’s ability to meet the requirements of its current lease on the Rademacher House. She says the police received a complaint that Crow’s Feet was violating OLCC regulations during its August First Friday Art Walk event—by not posting required signage and allowing a patron to carry an alcoholic beverage off-site—and that the property management staff observed non-permitted signage on the historic building. The First Friday complaint came from an off-duty employee of the Bend Police Department, Chief Jim Porter says. Rather than issue a citation, the department took an educational approach, he adds, sending an officer and representatives from the OLCC to the shop for a visit. And the signage, which Marchi says he thought was permitted, could be easily painted over. Still, Business Advocate Carolyn Eagan says the city has high expectations of businesses wishing to lease its properties.